I’m in Costa Rica, on a Pacific beach, hanging out with my daughter, writing my new book. So thank you for being so generous and kind and well, liking me and my running bra thoughts from the last post. It really blew me away. Thank you! Thank you! Thank you! I’m also constantly wowed by the cool stories you send that only add add further proof that the universe adores us all and is trying like bloody hell to point that out. “I recently took my first vacation by myself to Paris. It was a last minute decision. I was at a work conference in Amsterdam. I was a little nervous that I’d be alone the entire time…especially during dinners! “I do daily manifestations all the time because I love seeing them turn up in joyful ways. On the Sunday I arrived, I chose yellow bows to manifest. Sunday goes by and nothing, but I was exploring the Parisian streets so no big deal. Monday goes by…still no yellow bows…but I was having a great time none the less. I met some nice ladies at dinner. “She took me to the subway and explained how to get there. While I was on the subway, this guy in colorful attire noticed I looked confused as I stared at the mass intertwining of subway lines for the Paris underground. He asked where I was going and if I needed help. Turned out he and his bandmates were going to the Catacombs as well, they were from L.A. (on a side note ever since I started pursuing being a musician, I am a musical magnet lol). I had such a great time with these guys, especially the colorful one that first approached me. I’m offering a new experiment in the Hay House World Summit that begins May 9. If you register now, you’re entitled to five free videos. Hope to “see you” there. ← Are you smokin’ what you’re selling? Hi Pam, I actually bought the e2 as it pulled my attention in the bookshop, i started reading it and i did the 1. experiment and it work, the 2. took time but it worked half the 3. did not work and the 4. has till now not worked i have reached only to the 4. as i am still giving it time even if it is more then 48 hrs. but i dont know what i am doing wrong. could you pls. help me. thank you so very much. Pam… I am an Artist and visiting Europe alone for the first time ever!!! !! !❤️❤️❤️❤️❤️❤️Because of your book E-cubed ❤️❤️❤️that is with me (kindle) and inspires me daily. And putting into practice your audible book Living Big! I have always grabbed so one to go abroad with me… Knowing full well that I can stand in front of a painting for nearly 40 minutes…which is not so comparable other people. I am in Venice at the moment and have been here for nearly a month! I want to rent a studio here! Maybe in the mean time I will act as if I already I live here for 6 months and my other home Fairhope Alabama for 6 months. Anyway here’s to you!!! I happen to listen to “messages from Margaret” with Jerry Gavin…. By the way I amazingly booked a loft in the countryside of Venice and its owned by a World renown chef “Enrica Rocca” she assists Chanel in Paris and she has her own school. She invited me over to her wild loft in Venice I emailed her a gratitude for having a tasteful loft and I thought imeadiately she would love you and love your books . Yes you are the luckiest girl in the world and me too!!!! Always love reading these blog updates. I’m one of the dudes who takes your words to heart and is going to make his dreams come true! I had a great foundation thanks to my mom!!! Have a great Mom’s Day in Costa Rica and to all the moms out there…wow…thank you. Words cannot express what you have done for your children. You are the best! A funny story for you from this post. I’m a mother of two from Sydney, Australia and read your book. I experimented my heart out – but sadly no results. A little disheartened I abandoned your book, signed up to your emails instead and read sporadically on the train to work. It’s this ‘yellow bows’ story that touched me. I thought it was super sweet, so there on the train I asked to be shown a yellow bow in 24 hours. A random ask. 10pm that night prior to going to bed, I thought through the day, no yellow bows. The Universe is running out of time. At work the next day, I pop out in the afternoon for a coffee and at the last minute double back to reception to ask a question and notice a Mothers Day competition. The competition was to donate money for charity which gives entry into the draw. I donated, entered the competition and got my coffee. Back at work, I was writing about a upcoming corporate event and typed the words ‘High Tea’. I promise with all my heart this is true, literally that moment, my phone rings congratulate me on winning one of the prizes – a High Tea. Are you serious?! My fingers literally just typed the word. So down I go to claim my prize and I’m stunned again. In fact I can’t stop laughing. The package is tied with a yellow bow! So, your book’s been fished out from where all the abandoned ones go, and the prize will go to my ever sacrificing mum! Welcome to Costa Rica!!! 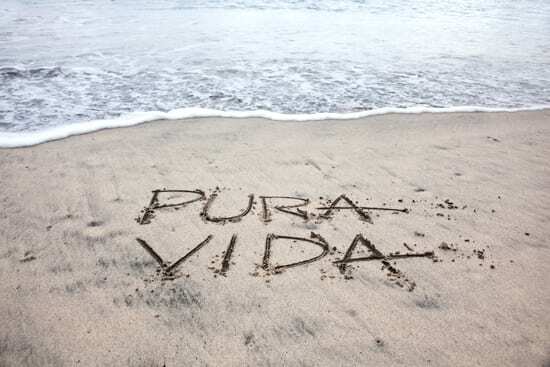 Hope you are enjoying the pura vida 🙂 Are you going to stay at the beach or are you planning to visit other sites? Enjoy my beautiful country!